From the makers of the Wrong No. and Mehrunnisa V Lub U, the dynamic team of Yasir Nawaz and Hassan Zia is on the road to yet again win a huge audience with Wrong No. 2. The original did a booming business at the box-office and now its sequel is eyeing to mint even massive moolah. 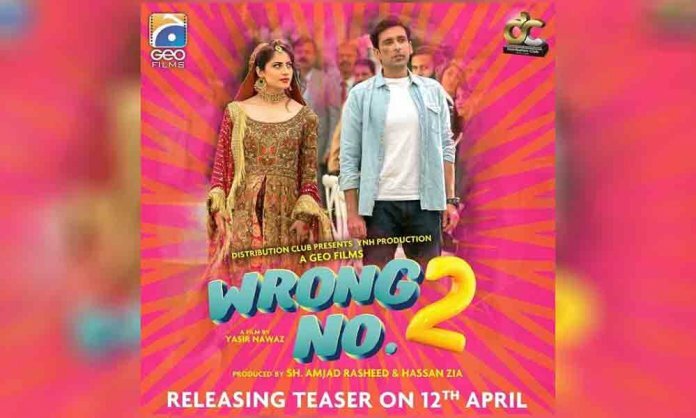 Directed by Yasir Nawaz and produced by Hassan Zia, Shamshsd Rasheed, the film is expected to be an adventurous roller coaster ride of romance and emotions, coupled with fits of laughter. The teaser of the flick is out and reveals the shenanigans of Javed Sheikh, Neelam Muneer and Sami Khan in full swing. The movie centers around Zoya, a young, rich girl, who catches the eye of Omer, her businessman father’s personal assistant’s son, along with a couple of other love interests that get involved in between. In a whirlpool of troubles, confusion and myriad complications, the movie is a challenge on whether true love can conquer all obstacles or not. The minute and a half long trailer promises fun and a fast-paced film with some powerful dialogues and upbeat music to compliment it. Neelam Munir looks stunning in her rich-girl attire, while Jawaid Sheikh’s dialogue delivery as expected, seems to be completely on point. Sami Khan’s comeback to films seems to be on the right track since he dances, acts and romances in style. Apart from Sami Khan and Neelam Muneer, the cast includes director Yasir Nawaz and brother Danish Nawaz, Mehmood Aslam, Nayyar Ejaz, Ahmed Hassan, Shafqat Cheema, Sana Fakhar, and many others. The film will be clashing with the Legend of Maula Jatt and Chhalawa this Eid.